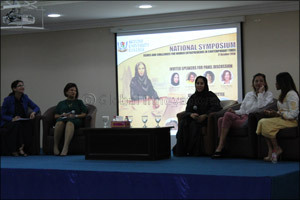 Sharjah, UAE, October 31, 2016: Skyline Entrepreneurship and Innovation Club (SEIC) hosted the National Symposium on Issues and Challenges for Women Entrepreneurs in Contemporary Times on October 17, 2016. Invited panelists are Ms. Najla Al Ansari, Polished Spa Founder and CEO; Ms. Janine Bensouda, Bensouda Consulting President; Ms. Ruchika Singhal, The Hair Crafters Company Managing Director and; PDSi Managing Director, Ms. Dawne Metcalfe. SUC is grateful for the participation of distinguished women entrepreneurs from UAE who shared their experiences and the challenges they had to go through while building their businesses. The discussion tackled topics related to Women Entrepreneurships with the Panel Moderator Dr. Kakul Agha, SUC Assistant Professor. SEIC members, delegates from the industry, and SUC BBA and MBA students were all present at the event. The panel discussion ended with words of wisdom from the panelists, which they shared to the audience. These inspiring women continue to make a difference in the lives of their spectators not only in the UAE but also across the region. The organizing committee of the symposium includes SUC faculty members: Dr. Mohit Vij, Dr. Kakul Agha, Dr. Gouher Ahmed, Dr. Anil Dubey, and Dr. Calvin Lee.